Quality, Performance, & Reliability you can count on, from SGMC Microwave. 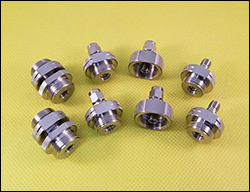 Passive Plus, Inc. (PPI) is a manufacturer of high-performance RF/Microwave passive components for the Medical, Semiconductor, Military, Broadcast, and Telecommunications Industries. We specialize in High-Q, Low ESR/ESL Capacitors, Broadband Capacitors, Non-Magnetic Resistors and Trimmers. PPI was established in 2005 in New York, founded by industry executives with over 30 years’ experience in Sales, Program Management and RF Engineering and Development. This application note highlights the network synthesis module within the NI AWR Design Environment platform, an electronic design automation (EDA) software technology that reduces design time in the domain of network synthesis by automating the development of impedance-matching circuits. Network synthesis is helpful at the earliest stages of a design to help determine reasonable performance targets based on device performance limits, device sizing (decisions on active device periphery), part selection for discrete packaged transistors, and other early design decisions. 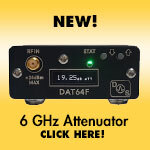 The new mmwave ADA-2052 active doubler will frequency extend your <26 GHz synthesizer up to 52 GHz with high output power and high harmonic suppressions. +20 dBm output power is provided over 30 to 52 GHz, and at least +16 dBm from 20 to 30 GHz, with an input from -6 to +2 dBm. This high performance GaAs MMIC chipset consists of an ADM-5974CH input buffer amplifier, MMD-2060HCH doubler, and AMM-6702CH output buffer amplifier. ADA-2052 is a RoHS connectorized module ideal for lab use, test and measurement, and prototype systems. Technology base: 1) GaN HEMT/SiC (for high output power); 2) GaAs PHEMT (for good performance and low-cost); and 3) GaAs FET (for good linearity) Products: (many are for wideband applications) 1) Discrete devices (GaN/SiC HEMT, GaAs FET, GaAs PHEMT): packaged and bare die DC-18GHz and up to 40W 2) MMIC power amplifiers (based on GaN/SiC HEMT, GaAs FET, GaAs PHEMT): wideband DC-17GHz and 1W- 20W 3) SSPA modules and pallets: 30MHz-17GHz and up to 100W. 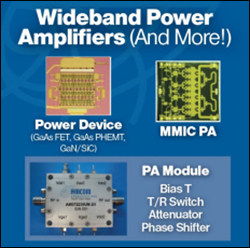 4) Microwave T/R switches, phase shifters, attenuators, and bias tees 5) Custom design: MMIC power amplifiers, module power amplifiers, as well as T/R modules with frequencies ranging from 10KHz to 60GHz with output power from 1W to 100W. 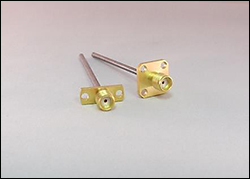 Herotek, Inc. has been a quality supplier of RF and Microwave components since 1982. Herotek is a broad-based, high technology company supplying parts for the Military, Industrial and Commercial markets with designs from DC to 75 GHz. It offers standard products as well as thousands of custom designs, and is happy to match existing products. Herotek offers Detectors, Comb Generators, Limiters, Switches, GaAsFet Amplifiers (Broadband, Low Noise, and Power) and integrated subsystems of many types, including up and down converters, multipliers, harmonic mixers, and transceivers. 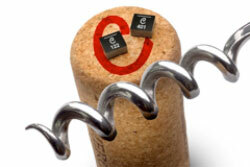 Coilcraft introduced its XGL4020 Series of high-performance, molded power inductors. The XGL4020 features the industry’s lowest DC losses and extremely low AC losses for a wide range of DC-DC converters (from hundreds kHz up to 5+ MHz). Additional performance improvements include a wider range of inductance values and improved Irms current ratings. Our Editorial Director, Publisher and Associate Publisher have more than100 years combined experience in the technology we cover, with more than 60 years of that time in technology publishing. With both engineering design and product marketing experience, we have the perfect combination to serve our engineering readers as well as our advertising clients. 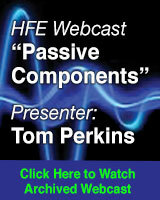 High Frequency Electronics has the mission of providing an exchange of ideas among engineers. Our hands-on design experience and many years of industry participation allows us to wisely select the right mix of subject matter, at the right technical depth for engineers of all experience levels. We like to think of our magazine as delivering a “chapter a month” of essential tutorial, applications-oriented and advanced material — an ongoing textbook for the continuing education and professional development of our readers. In keeping with our attention to substantive content, our magazine is designed to present technical material clearly, with a clean, highly readable layout. This approach has a benefit to advertisers — ads stand out prominently when articles do not have unnecessary artistic frills. 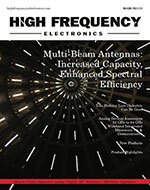 Every issue of High Frequency Electronics is available online — with exactly the same appearance as the printed issues, in the universally accessible PDF format. The Online Edition is interactive, too. Readers can simply click on an ad to reach that company’s web site. Our web site also includes news headlines, events listings, supporting information for authors and advertisers, plus new and renewal subscription services. Every past article we have published is archived for download by any interested web visitor. The Archives is the most-visited part of our web site! We take pride in our professionalism, knowledge and cooperative attitude when dealing with advertisers. We can help you develop a marketing and advertising plan with the options of print ads, web site banners, direct mail, e-mail marketing, print brokering, and many other service options. Contact the advertising sales representative in your area, or inquire with the Publisher or Editorial Director.